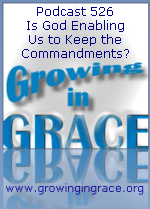 Growing in Grace Podcast: 526. Is God Enabling Us to Keep the Commandments? 526. Is God Enabling Us to Keep the Commandments? Even after the cross where we abide in Christ and have entered into a new and better covenant, the religious crowd will advocate that Jesus now empowers us to fulfill the law. They claim the law from the former covenant did not end and the commandments within that law are still meant to be followed by Christian believers in order to acquire or maintain life, righteousness and sanctification. The question that never gets fully addressed is this: Exactly which of the 613 laws are to be followed and which are no longer meant to be applied? We discuss the inconsistencies with this type of mixed covenant teaching.